The Kizashi is Suzuki's fastest (top speed of 215kph) and longest (4650mm) model in Europe. Launch dates: United States, early 2010; Switzerland, April; rest of Europe and Russia, October. Main competitors: Toyota Avensis, Honda Accord, Mazda6, Skoda Octavia, Peugeot 407, Citroen C5, Seat Exeo. Annual sales forecast (Germany): 700 in 2010; 1,000 in 2011. Base price: 26,900 euros (about $37,460). Cleanest model 2.4-liter gasoline engine needs 7.9 liters per 100km (34 U.S. mpg) and produces 183g/km of CO2. The best bits: Optional all-wheel-drive system that improves handling and performance in all weather conditions mated with a continuously variable transmission; standard electronic stability control, park assist and knee airbag for the driver. 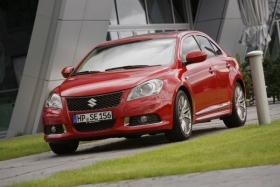 BONN – Suzuki is hoping that a sporty design and competitive price will make the Kizashi a surprise hit. The Kizashi, which in English means "something great is coming," is the Japanese automaker's first model in the mid-sized segment, which is dominated in Europe by the Volkswagen Passat, Opel/Vauxhall Insignia and Ford Mondeo. The Kizashi debuts in key markets such as Germany, France, Russia and the UK this month. An all-wheel drive variant with a continuously variable transmission arrives before the end of the year. Suzuki says that it is not going to challenge the segment's top three sellers. Instead it wants to win sales from Japanese rivals such as the Toyota Avensis, Honda Accord and Mazda6 as well as French competitors such as the Citroen C5 and Peugeot 407. With a starting price of 26,900 euros (about $37,460), the Kizashi is 1,950 euros less than the Avensis and more than 3,000 euros less than the Mazda6 with comparable engines. Suzuki plans to sell 700 Kizashis in Germany in 2010 and 1,000 in 2011. The total German market is usually about 3 million units a year. Suzuki Europe declined to reveal its sales goals for all of Europe. Suzuki's group leader for product marketing and accessories, Francesco Sini, admits that the automaker is being conservative with its sales targets for its fastest (top speed of 215kph) and longest (4650mm) model in Europe. “We are hoping for to be surprised” with greater-than-expected demand for the car, Sini said at a press event here to launch the sedan. One of the reasons for the low expectations is that the Kizashi only offers a 2.4-liter gasoline engine in a segment that is dominated by diesels, especially in Germany. Also hurting potential sales is that no station wagon variant will be offered. Suzuki Germany spokesman Axel Seegers said that the car is aimed primarily at the Japanese and U.S. markets, where wagons and diesel powertrains are shunned. Suzuki's target buyer in Europe is an image-conscious man in his 30s who is familiar with the Suzuki brand and is looking to move out of a Swift subcompact or a Grand Vitara medium SUV.